On Chess: Will The Speed Of Chess Help Make The Game More Popular? Chess is one of the oldest sports in the world. Although it has a long, time-honored history, it, like all sports, is due for some change. To bring the sport into the new millennium, chess should be more accessible for the audience, and, at the same time, more entertaining. The classical format (90 minutes or more) should be used just in rare or special occasions, like the World Championship Match (although the last one was decided precisely in rapid chess tiebreak). Chess tournaments should be played in active chess with a time control of 20-25 minutes for the entire game and only a potential delay of five seconds per move. This new format is called the Elo system, and it employs a method for calculating the relative skill levels of players in zero-sum games. It could get adapted easily and quickly and, once used, every open chess tournament would last three days, maximum. In reducing the time of an average tournament, the expenses for organizing chess tournaments would be lower and therefore potentially beneficial from an economic point of view. 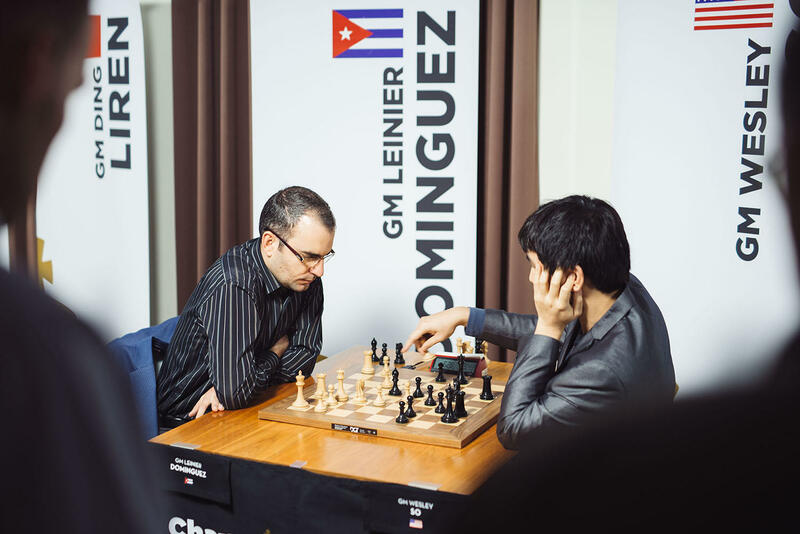 Grandmasters Wesley So and Leinier Dominguez face off at the 2017 Champions Showdown. Each round could consist of two games with the players alternating colors, and, ultimately, the games would not last longer than two hours. With this new organization, the tournament would have three rounds a day, which would be about six hours of gameplay. The participants would play nine rounds, and the result of each one would give the opponents the exact amount of points as current chess tournaments do: one for a total win of the mini match — whether with 2-0 or 1.5 - 0.5, 0.5 for an equal score of 1-1 — and zero points for a lost match. The exception is in a case of a final tie at the end of the tournament. Then the first tiebreak can be the total amount of points (so it will not be the same if you have won the matches 2-0 or 1.5- 0.5). With this style of tournament, spectators would enjoy a range of emotions during the rounds and alleviate players’ fatigue. Nowadays, the classical formats can have players sitting at the chess board for 10 hours a day (in an open tournament format) without generally allowing time to get a decent meal between the rounds. This format would also potentially reduce the amount of complaints about the number of White or Black chess games, because this factor would never be a problem. Although this is an idea, the need for chess to apply an almost entirely active chess format is an obvious necessity to me. Chess has to adapt in order to survive and to be actually present on national television and not only broadcast on the internet. To make chess more mainstream, it needs a lot of love and care, and this is exactly what I witnessed on my first visit to the famous St. Louis Chess Club. I was amazed not only by the professionalism of the entire staff, but, most of all, I’m amazed by the sacrifices they make to push forward the game of chess. To sacrifice is to be able to express a pure and honest love. Love for chess is what I have seen at the St. Louis Chess Club, and I know that the future of this chess club looks very, very bright! Coming up, the Chess Club will be hosting a classical tournament for some of the top female players in the world — the Cairns Cup — which will be followed by the Champions Showdown: The Kings, which will introduce faster time controls. Stop by the Chess Club in the month of February and decide what speed of chess you think the world should start watching. Atanas Ivanov Kolev is a Bulgarian chess grandmaster with more than 30 years of practice as a chess player and coach. Kolev and fellow Bulgarian grandmaster Kiril Georgiev are co-authors of The Sharpest Sicilian, a book about the Najdorf Variation of the Sicilian Defense, which was published in 2007. Atanas and Macedonian grandmaster Trajko Nedev are co-authors of The Easiest Sicilian, a book about the Sveshnikov Variation of the Sicilian, which was published in 2008.